My GBD, Not a great smoker anymore!! There was a thread named, "show us your GBD's" --->Fourm here and I was gonna post mine. I got it all cleaned and polished and then this happened! It's a Pinner Giant and was a great smoker. Does anyone know if there is something I can buy at a hardware store to fix this, Or would I have to send it to a professional? Dang! Maybe you should send it out to someone. I don't think glue is gonna do it for the stem. Walker Briar Works. Sorry, that looks like a heartbreaker. I have a pipe with a particularly delicate sized tenon, I've broken and replaced the stem in that pipe almost as many times as I've smoked it. Good luck. Walker charges around $30 for a new stem, that one looks worth saving. He also sells a Delrin plug, that is drilled to accept a threaded tenon insert back into the vulcanite stem. You just have to drill and tap the stem to accept the insert. the replacement stem as well. Costs pale in comparison to the value -- especially if it's a good smoker. Worth saving? Yes, although I believe that the rondelle is not brass but, from the picture, imprinted as are the later pipes. I can vouch for Floyd Norwood's work. He's rescued a few of my pipes. Got to save it, man. A thirty buck repair is more than acceptable for an excellent smoker. AGGGGH! My sympathies! I dread such a mishap! "Mount quickly and ride! There is a miasma over this village!" Some years ago, I dropped my beautiful Peterson 264 on a cement floor, where it landed just right to break the P-lip stem right off at the silver band. This was a high-end Pete and a very expensive pipe for me at the time. I called Wally Frank, who had sold me the pipe and decided to have them fit a new P-lip. $15 and a couple weeks later I got it back. I am smoking it now -- and often congratulate myself for getting it fixed. I agree with folks here -- have a reputable craftsman repair your GBD. +1 on Walker Briar Works. DOH!!! I did that to the second pipe I ever bought. It is a crappy ole basket pipe though. I'd talk to Lonestar. He makes fantastic pipes and his prices are awesome. Maybe he can help you out. Definitely worth the repair. Plus, the new stem and tenon will be stronger than the original. It is worth the investment if you like the pipe. I had the same exact thing happen to my favorite pipe! Still sitting with the others, broken. Too cheap of a pipe to send it out. They did a complete restem on my GBD Congress, and floated the logo onto the new stem properly. Dave@ Walker said he doesnt have any more brass rondells. But he can swap in a donor if you have one. 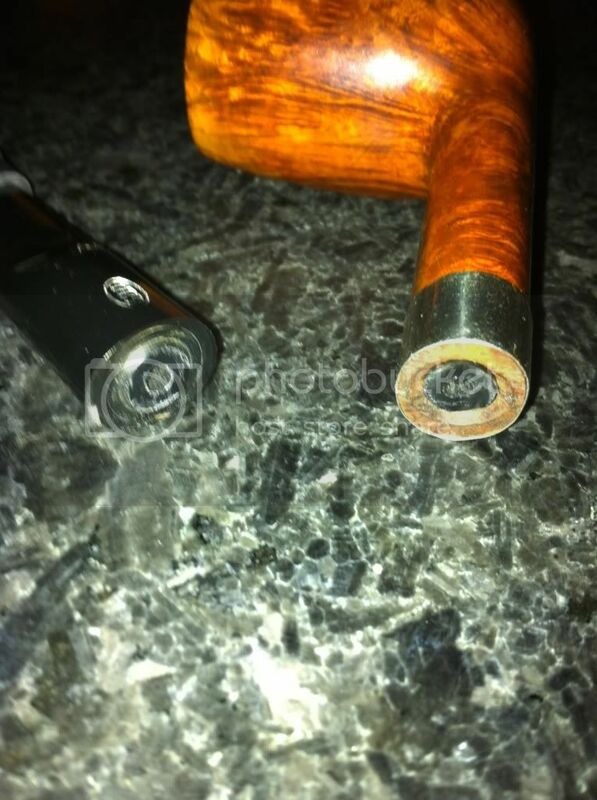 sorry for bad luck sjpipesmoker, i know you can have just the tendon repaired instead of a full stem repalcment. i have had only tendons relaced.